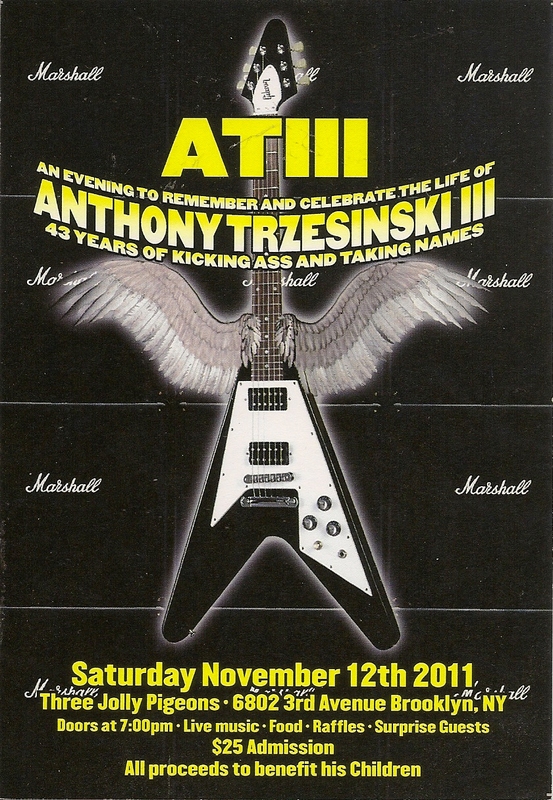 Back in November 2011 I blogged about my hitting the studio to reunite with my former band mates in the band Machine as we prepared for a benefit function that was to honor our guitarist Anthony Trzesinski III who had sadly passed away at the beginning of 2011. The rehearsals for our part of the evening went pretty good for the most part and it would seem that we would be able to pull it off in his memory. If you somehow missed that posting, you can click HERE to read it and then return to this one for the second chapter. This blog post while coming a little after the first anniversary of Anthony’s passing, reflects upon the re-assembly of Machine that happened at the memorial event. One of Anthony and the bands longest time friends, Ron Valdes, designed a great flyer that was given out and left in assorted places to generate interest. This same design was applied to the laminates that were made for everyone who was participating this evening. I felt this was a striking design. Nice work Ronnie. 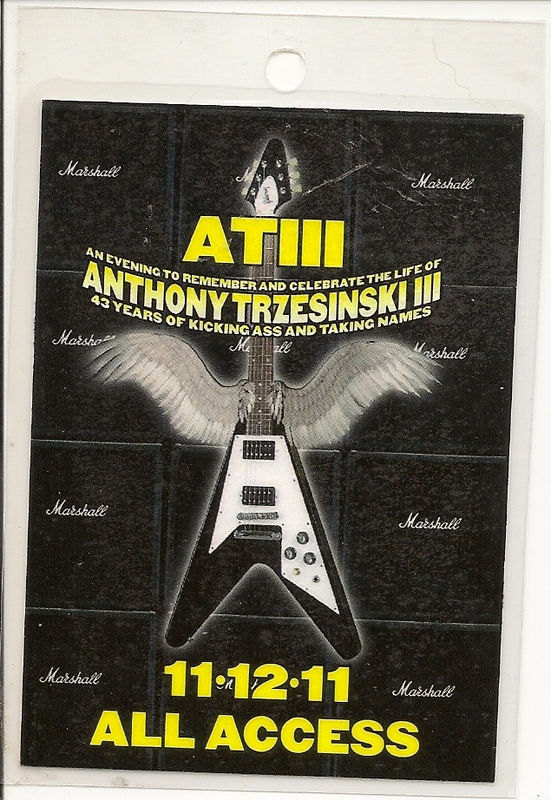 The event was a special one for sure and Anthony was one who loved the live music scene very much so the use of laminates for the participating musicians and the guests was a great one. Just to clear it up for those with questions, everyone had the “All Access” type of laminate. There was only one kind made. It might have been fun to have a couple of different ones like you see at shows, in essence “Press”, “Fan Club” etcetera but better to just make one for all to use. The banner appeared to had come courtesy of Coors Brewing Company and that was really great of them. It looked fantastic but I cannot stress enough how awful it was to see ones former band mate and friend’s name on such a banner. Here was the flyer that showcased the evening’s musical menu from start to finish. 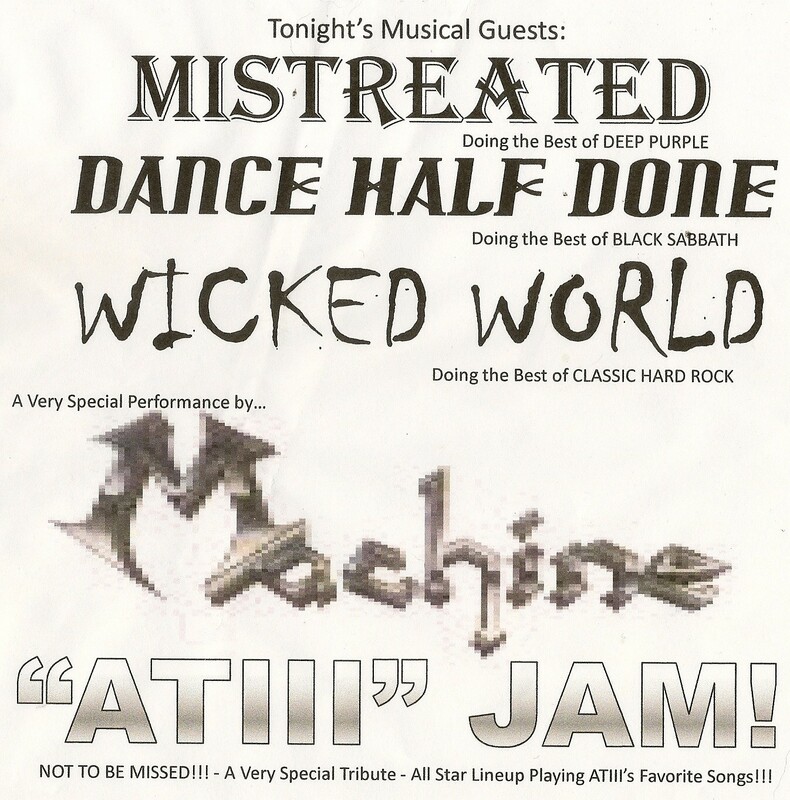 Starting it off would be Mistreated (Deep Purple covers), Dance Half Done (Classic Rock and Soul covers that feature our own Skeleton Pete on guitar), Wicked World (Rizzo’s Black Sabbath band) and then the brief Machine set followed by a multi-musician structured jam. Rizzo actually sang for the first two bands because his singer A.J. was unable to attend and while I took some visuals from those respective sets, they are not presented in this narrative. My view for the next twenty five minutes or so looked a little like this. 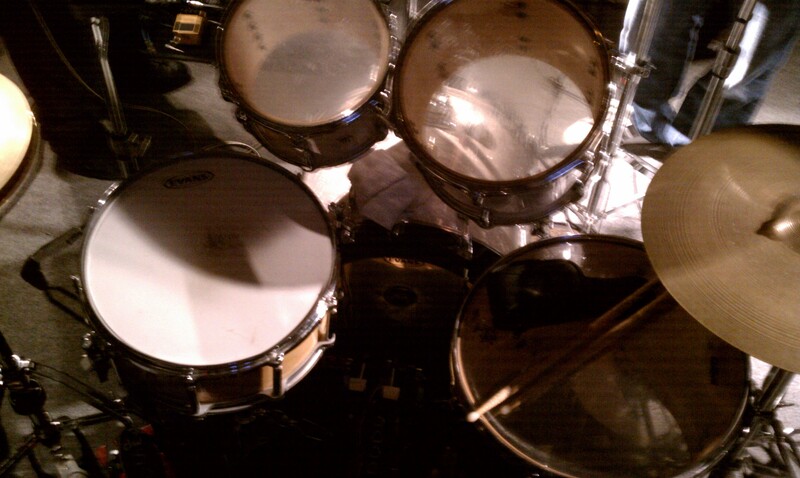 I was using a combination of Darren Morgenthaler’s drums and Steve Morante’s cymbals. It made no sense for me to bring anything more than my pedals because these two were playing a majority of the night. I did however very much appreciate them letting me use their gear and to thank them I acted as road crew. Now it was time to get to work as there was Metal to be done. Standing off to the side of Jeff’s amp was one Ralph Torres who used to be one of our illustrious Road Crew. Back in the day it was usually Ralph, Sal, Rob F. and Trig who helped get the band up and ready to Rock. Sadly none of the other guys would be present for the benefit event and I admit that it would have been nice to see them there. Ralph stood strong like he would in the old days and told Jeff “when Machine goes on stage, I am right here on the side”. Thanks for all the help this evening Ralph, it was really good of you. After the gear had been adjusted a little bit for our few songs set, our friend and main organizer of the event Joe Affe got up to speak. 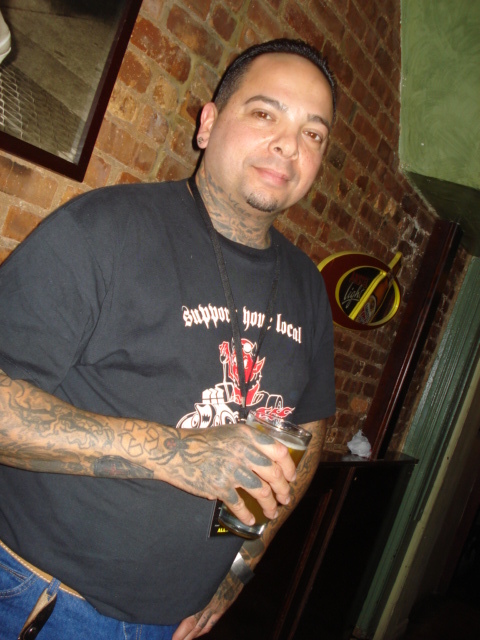 Joe is also a member of the band Maximum Penalty who I have reviewed over on PiercingMetal.com recently. They played with Madball and that article can be seen HERE. The first song we played would be “Mechanikill”. It was one of our most popular tunes. You might hear Rob Rizzo our guitarist asking the crowd who has the Machine “demo” on cassette as that was what we were able to release back in the day. We did three songs on the thing and it ran us a few thousand thousand dollars to do it. Nowadays such cash would have gotten us a full CD, thousands of copies to sell and perhaps more t-shirts than we knew what to do with. That’s Tom Ewok yelling that he has three of them. To my knowledge there were really three demos done but two were very DIY and recorded in both my parents basement and Anthony’s room. Home recording was a lot more involved back then and you made due with what you had. I think one day I will do a reflection blog post about this part of life soon with some vintage photos. “Misery Loves Company” was always fun to play live and had some cool crunching moments and slow to fast tempo changes. Luckily we pulled it off with the drive it was supposed to have. There is some debate about what the first song Machine actually played together in the live sense and while Jeff maintains it was Motorhead’s “Iron First” I could have sworn it was Sabbath’s “War Pigs”. Whatever the case may be we did the Motorhead tune but sadly the space on the memory card ran out before the song completed. We also did “No Class” but that was not captured on anything to my knowledge. Machine performs “Iron Fist” by Motorhead. Sadly no one thought to get a group shot of the three of us all together or even gathered at the giant photograph poster of our fallen Metal brother. I didn’t think of it myself and that surprises me since I am generally one of the first to realize “the shot” is there after being a music photojournalist for these past eight years. Oh well. The whole night was just moving too fast and everyone’s head was loaded with thoughts and stories from back in better times. 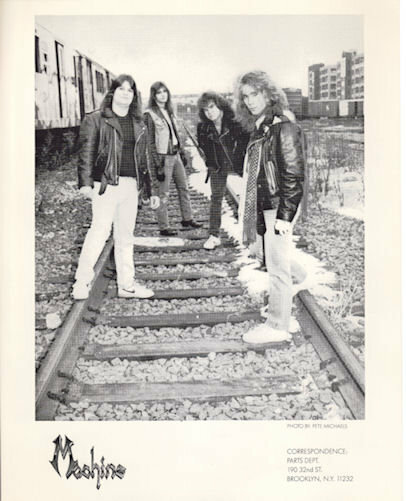 I will instead close out this narrative with a press photo from the bands heyday that was taken down on the rail tracks somewhere around First Avenue in the lower 20’s in Brooklyn a very long time ago. I appreciate the time that Tom “Ewok” took to capture these videos for me with the Panasonic Lumix and I hope to get a gallery of shots that were done by Skeleton Pete to add here in the future sometime since he was shooting the event as it took place. 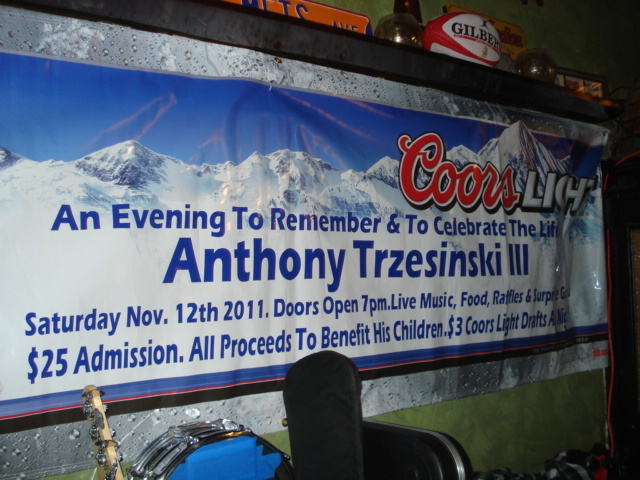 Overall the night was a success and we all raised a nice chunk of cash for Anthony’s wife and children. That was the most important thing at the end of the day. Thanks lovely. So kind of you to think so. Sad news about Anthony – far too young. 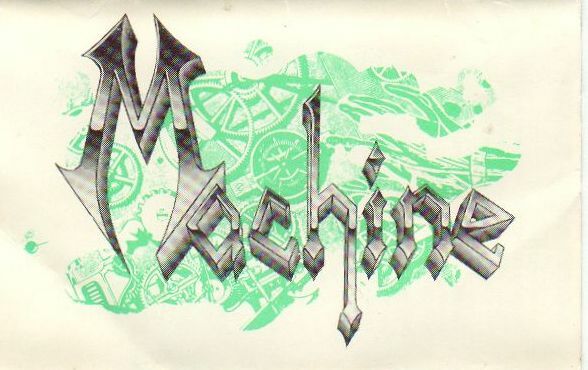 Machine was a really cool band – too bad they turned down being on ‘Metal Massacre’ when it was offered to them. Would’ve added a lil’ bit extra to the legend. Machine appeared on a compilation CD called “Street Heroes” which was done after my tenure. I have no knowledge of the band being asked to be on “Metal Massacre” so guess this was also done after I was out of the lineup. Glad you liked it just the same.